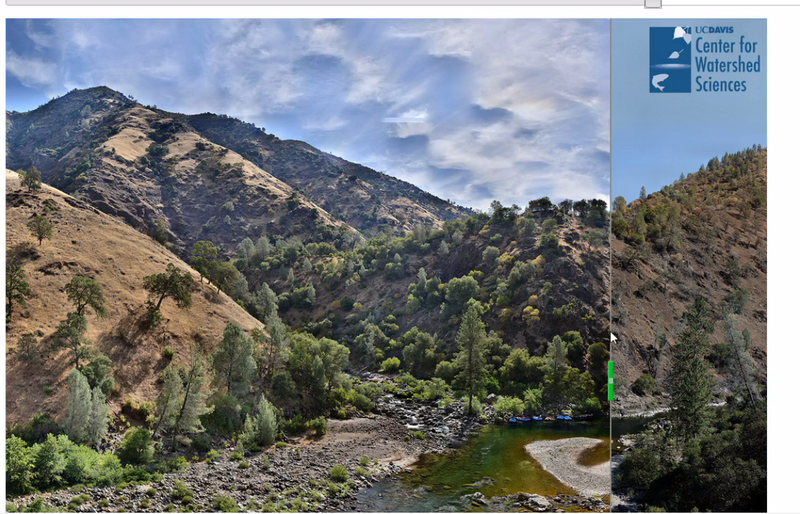 The UC Davis Center for Watershed Sciences has long term study sites at the confluence of the Tuolumne and Clavey rivers, near where the Rim Fire of 2013 started. As part of these long term study sites, we captured a gigapixel image of the confluence in June 2013. Center staff went back soon after the fire, in mid-September to check out our equipment and the fire’s damage. This area of the fire burned at a lower severity than many areas, but the evidence of fire was clear. They captured a second gigapixel image of the area from the same location at that time. Afterward, Andy Bell, a researcher at the Center rectified the two images to each other so we could view them together. I built a viewer online that let us compare the before and after images, and change the size to zoom in. This work was picked up by a few news outlets, including KQED in San Francisco.